This has been an awesome read, seeing you folk "in action" doing your utmost to ensure the survival of an amazing animal and it's enviroment is inspiring. Question though, Why wouldn't the continued discussion relating to critically endangered species be suited to the open forum? Well Fred, short answer, politics and diplomacy. Sooner or later someone will bad mouth the mining company and/or NatCon. And that is not the way to go. Also there are those reading this who's intentions may not be honourable; so we cannot be too site specific. And remember collectors are very good at what they do, I am not going to repeat all the instances and species that I know of, but you get my drift? I know this is off topic but will someone please post more info on this species, is it really facing extinction? Kinda makes a bit more sense in that light... Thanks Armata. Well, here is what one looks like, a male. As you can see the five species of the cornuta/inornata group are very similar in appearance. 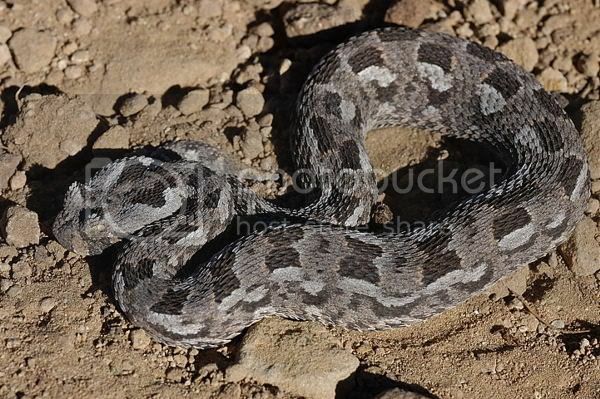 The dwarf adders as a whole, above plus the other small adders have been placed in the subgenus Calechidna, with the exception of the Kenyan endemic Bitis worthingtoni, which was placed in subgenus Keniabitis, the sole member of this subgenus. The taxonomy is still ongoing. Copperbob wrote: Has anyone spoken directly to the mining company or land owners? I say this because no company wants to have "Extinction of a species" on their resume, especially now with most companies trying to be "environmentally friendly". Maybe consider buying a few PPC shares, then you have the right to get this issue as a agenda item at the company's AGM and force the directors to dealwith it and state a position in front of all their shareholders. If you could get a large institiutional shareholder to vote with you it may be possible to accomplish quite a lot. This would be by far the most effective means of highlighting the plight of bitis albanica, will take time and dedication from an individual or a group though. I spent most of my money on fishing, booze, and women. The rest I just wasted. Thanks Tony, how badly endangered are they of becoming extinct? Well Wolf, maybe even in my lifetime, and I'm er, well, quite old. But BS hit a true note re the unique habitat and biodiversity. BS if we could draw up a species list, inc plants and butterflies, it would be a good plan. I hope this all turns out for the better, because if it doesn't then this species may also end up on the list of animals ill never get to see in my lifetime. @Telescopus Please correct me if I’m wrong but are you saying this type of Bontveld is unique only to this specific area. It seems like their habitats and the snakes themselves haven’t been studied very well, another reason to try and protect them. @Rob I suppose it’s easier said then done hey. About keeping some information secret, defiantly! Only the guys that are directly involved need to know certain information but please keep the rest of us updated. I’m sure that if we all pull together, we will get somewhere. This is Africa and POWER BY NUMBERS seems to be the only way to get anything done. It’s great to see foreigners are also willing to help out where they can. So I think its safe to say their are a lot of people standing behind the guys who are directly involved with the situation. Lets also make an effort not bad mouth any of the organizations involved. It does seem as though there is a lack of research on them, nobody has answered my previous question yet. The land owners will ask for reasons based on research by recognised scientists before they will accommodate the conservation of this species. I feel that the ball is in 'our' court, unless I'm mistaken, we need to have a watertight argument and proof to back it before proper pressure can be applied on them. We need to prove firstly that the bedrock and vegetation is vital for their existance, and determine why the won't occur in nearby regions where the geology and flora differs. Even their classification seems to be undecided, Wolverine has a valid point. What were the findings when SARCA did their research in the area? I believe that B. Albanica were found close to Grahamstown not so long ago, what conclusions can be drawn from this? Exactly how bad is the situation? Facts guys, where's the facts. FROOT - I dont think SARCA did anything in that area. As far as Im aware you are correct, Grahamstown was a locality too, one of 5 which is now down to just 1. Very sad. Conclusions? That we are developing too fast with little regard for nature. The thing about trying to get a portion of land allocated, how big does it need to be? In my opinion the size needed will far exceed the size the cement company would ever consider allowing. Then once the mining has stopped and all is moved off, now the place is a known hotspot for these snakes, will there be "game guards" to stop collecting? Forgive me for being pessimistic but that's the way I see it. Tonys prediction of them possibly becoming extinct during his lifetime is not far off the mark in my modest opinion. Just a thought (I may have overread), but is albanicas IUCN status not still 'data deficient'? Surely if research could tie up its IUCN and red data book status to 'critically endangered' then more could be done to stop development in there habitat range? Its not only the cement company that has stakes in the habitat surely?